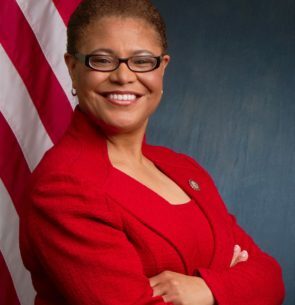 Congressmember Karen Bass was re-elected to her third term representing the 37th Congressional District in November 2014. Congressmember Bass serves on the House Judiciary Committee and the House Committee on Foreign Affairs where she is Ranking Member of the Subcommittee on Africa. She was selected by Democratic Leader Nancy Pelosi to serve on the prestigious Steering and Policy Committee, which sets the policy direction of the Democratic Caucus, as Organization, Study and Review Chair. Congressmember Bass is also playing a leadership role in the Congressional Black Caucus (CBC), where she serves as Secretary for the 114th Congress. Throughout her career, Representative Bass has maintained a focus on our nation’s foster care system. In her first term, she created the bipartisan Congressional Foster Youth Caucus along with co-chair U.S. Rep. Tom Marino (R-Pa.), which aims to transform the foster care system in America. Prior to serving in Congress, Representative Bass made history as the first African American woman to serve as Speaker of the California Assembly. In this powerful state legislative role, she helped California to recover from the greatest economic crisis since the Great Depression.